Privacy is a bit concern on iPhone as it plays an important role in our daily life, such as text messing, social networking, payment and business. So when we start to think selling the old device for a new one, the first thing we need to consider seriously is how to prevent our personal information being leaked. Step 1: Tap on 'Settings' icon on iPhone homescreen. Step 3: Select 'Reset' at the bottom of the list and choose "Delete All Content and Settings"
Dangerous : Easily Be Recovered by Most iPhone Data Recovery Softwares. However, this method is not that secure in terms of high standards as the data can be recovered by utilizing this factory reset. 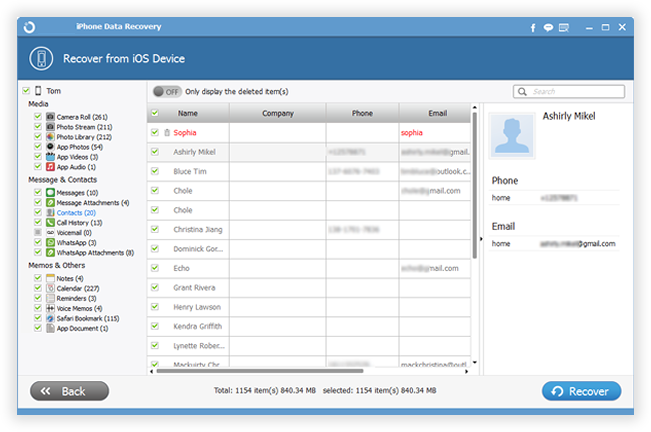 In fact, after you deleted your data or factory reset your iPhone device, the data themselves still exist on somewhere in the memory and easily be recovered by some iPhone data recovery softwares in the market..
We have done the test with any two of iPhone data recovery softwares. Testing 1: Scanned out all messages, phone numbers, name and other data. Just one click, everyone can recover these data and save to computer. Testing 2: Scanned out all contacts and other data. If you really cared about your person information from being leaked, you should make sure that there is no chance to restore such content when you selling or handling the device to someone else. It is highly recommend to use the following method I am gonna to mention in the next section, as the data will be deleted permanently even the military forces can't get them back. Maybe most people still don't know that actual contents of file are not really deleted when performing simple deletion operation on your iPhone or other devices. But they are just marked for deletion and not shown in the file system of your iOS device. The actual data are still physically present on your iPhone. For iOS system, the only way to completely erase the data is to overwrite the original contents. If you want to completely eliminate all traces of data on your iPhone, iPhone Data Wiper could be a good choice, it provides four erasing options to ensure all deleted data were overwritten and erased without the possibility of recovery by any practical software or hardware methods. 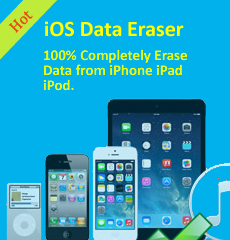 It can erase text messages, photos, contacts, call history and other data for your iDevice without harming your device and data. 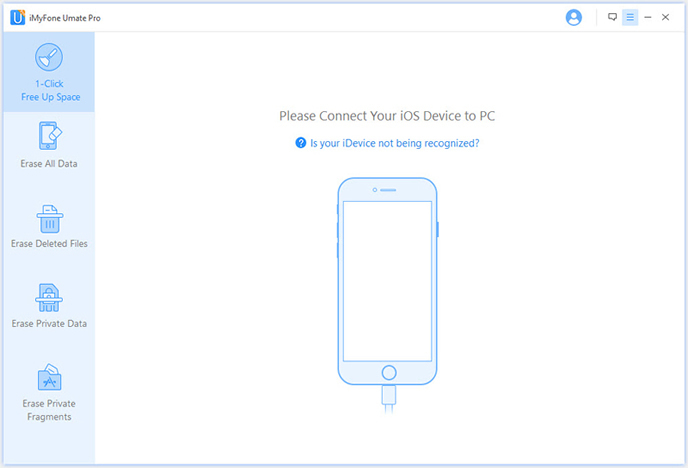 In this post, we'll show you how to permanently erase everything from iPhone before selling. Download the .exe file from below download link and double-click the file to begin installation process. There is a built-in wizard guiding you through the entire process. After that, the software will be opened automatically and a shortcut will display on computer desktop. Plug the iPhone to computer via USB cable. The program will detect the device once it was well connected. Then you can proceed to the next step. However, if the program can't detect the device, please make sure iPhone USB driver and iTunes are installed properly on the computer. Note: The program offers 4 erasing option for your different demands: "1-Click Free UP Space", "ERASE PRIVATE Data", "ERASE DELETED FILES" and "ERASE ALL DATA". You can select the appropriate option and give it a try. As we want to erase everything stored on the iPhone, so the first method is preferred in this case. Select "Erase Deleted Data" from the sidebar, which leads to the next step. Step 3 Start Analyzing and Scanning the Data on Your iPhone. 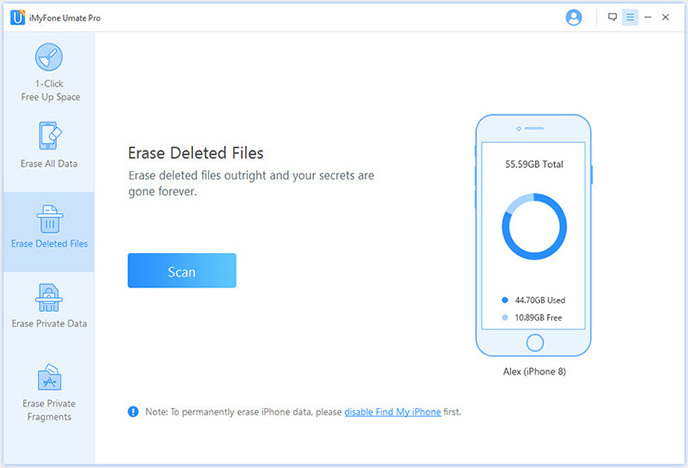 In this step, it will automatically analyze and scan all your deleted files in your iPhone device; generally it takes few minutes to complete the process depending on the file. After scanning – select the deleted data to view detailed information on the file. After scanning, all deleted data will be scanned out and presented as details, by default, all files will be selected. Unselect the files you wish to keep. 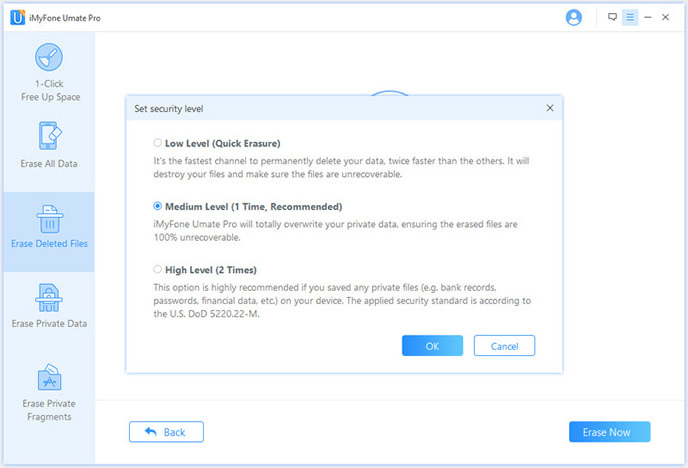 You can change the security level to more thoroughly smash your data without recovery, the High Level will take more time to erase your data. Input 'delete' and click Start Button to confirm that you are going to erase all the data on the iPhone. 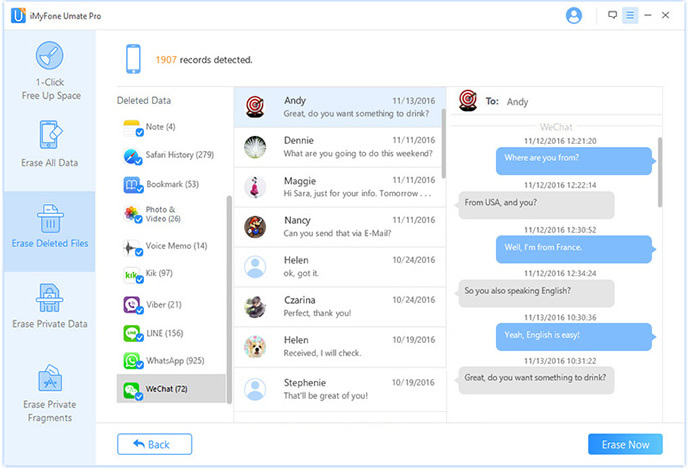 Then the program starts erasing apps, music, videos, photo, contacts, SMS and other files stored on the device. It only takes a few minutes to complete the task. 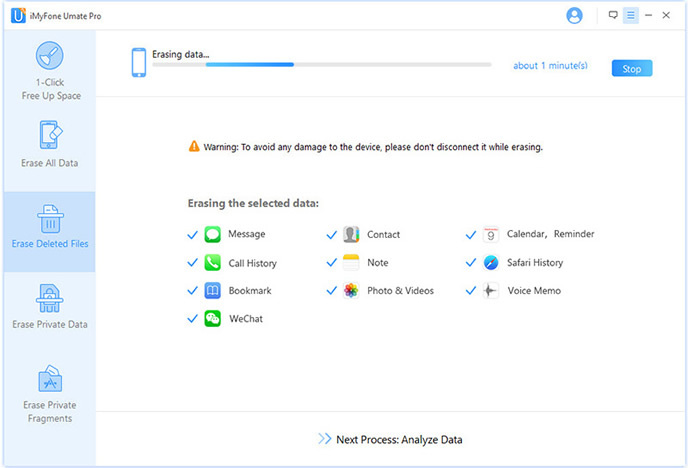 After you erased already deleted data, you must erase all data again from your device by selecting Erase All Data. 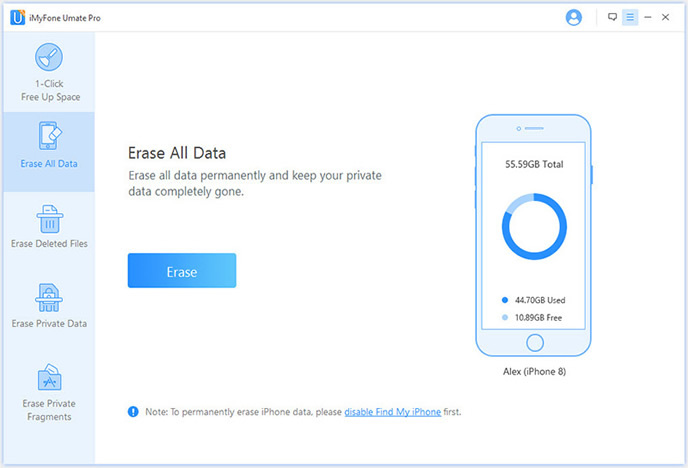 This time, it will erase all existing data on your device. It will ask you for confirmation before it starts erasing so make sure you are certain you want to continue as this is your last chance to prevent data from being accidentally erased. 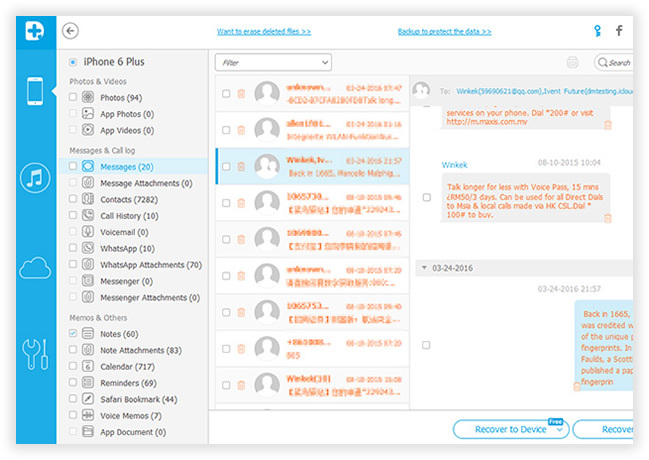 You should be no longer worries about your privacy being leaked by using the fancy program. Let's being said, even the most sophisticated data recovery software isn't able to get any information from the given device. It's definitely worth the money you spent on it. And there is no additional fee if you use the program on multiple devices in future. Franklin Lee is the senior editor for safewiper studio and is enjoying discovering most useful Tips and Tricks in the iOS world.